Our history. Our passion. Our legacy. It takes vision to meet consistently the needs and desires of the homeowners for whom we build. 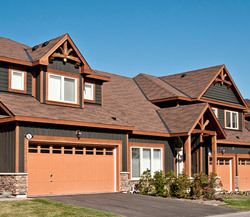 MacPherson has built a reputation by designing exactly the kind of home demanded by buyers in unique neighbourhoods across Ontario. Since constructing its first three townhomes on MacPherson Avenue in Toronto in 1994, MacPherson Builders has grown into the premier builder and developer of low-rise residential communities in small-town Ontario. Starting with a 27-lot subdivision in Fergus and a 43-lot estate community in Erin, MacPherson has grown to become a developer and builder of master-planned communities of up to 500 homes. MacPherson Builders believes in developing the premier, and often the largest, residential communities in the municipalities in which we are active. As both builder and developer, MacPherson Builders is able to design its homes and surrounding amenities to fit our purchasers' lifestyles. MacPherson Builders does not buy other developers' building lots - we start with our purchasers, and build our communities around them. From our construction managers to our accounting staff, from our site clerks to our design team, everyone at MacPherson Builders is committed to excellence. Recognized by the Greater Toronto Home Builders' Association with its prestigious SAM award for design, MacPherson's in-house construction management team is second to none. MacPherson Builders manages the entire process, from vacant field to the day our purchasers move into their new home, right down to the last faucet, tile and (of course) kitchen sink. By vertically integrating the entire construction process, MacPherson leaves nothing to chance. We know our communities like the backs of our hands. Russell Higgins founded Mandarin Creek Developments in 1988, prior to joining forces with Mr. Teper at MacPherson Builders in 1994. Prior to founding Mandarin, Mr. Higgins was a real estate analyst for the First Boston Corporation in New York City. He is a graduate of Upper Canada College and Princeton University and lives in Toronto with his wife and family. Russell Higgins founded Mandarin Creek Developments in 1988, prior to starting MacPherson Builders in 1994. Prior to founding Mandarin, Mr. Higgins was a real estate analyst for the First Boston Corporation in New York City. He is a graduate of Upper Canada College and Princeton University.